Furla's assortment of bags, shoes and accessories is full of colorful creativity. Fashion friends from all over the world appreciate this. After the first Furla bags were sold exclusively through the wholesale, the company was able to open in 1955, the first store in Bologna. This one can still visit today - as well as the other Italian branches and now also numerous stores in, inter alia, the US, France and Japan. As a family business that continues to grow internationally, Furla is one of the major global players in the leather goods market. The basis for this can be found in the historic offices near Bologna and in a noble palace in the fashion capital of Milan. Anyone who wants to buy a leather bag designed by Furla chooses leather goods inspired by Italian art. Reflecting on the future of art and fashion design, Giovanna Furlanetto, daughter of the company founder, founded a foundation in 2008 that supports young talents. 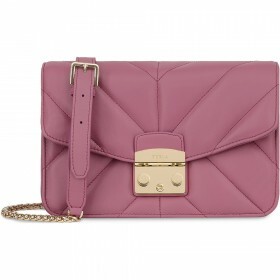 Whether with pattern or plain colors - Furla bags bear witness to the style awareness of their wearers. With the different models you can complete your outfits and bring more elegance to almost any situation. Furla's leather creations are made of only the finest materials that have been cleverly crafted. Every handbag shows the quality of production that was responsible for its creation. By means of noble manufacturing techniques shapes are achieved, which ensure timeless and functional bags. This is reflected in details such as the fine piping and stitching, but also on the adjustable straps, which often allow different styles of wear. So you can use many models of this brand as a handbag as well as a shoulder bag. A look at our leather goods online shop shows that the focus of the designers is on fresh colors and decorative designs. In addition to the models with eye-catching patterns and bold colors, some bags are available in more neutral colors, so you can wear a chic Furla bag for reputable occasions. The trendy handbags for a stroll through the city or a casual workday, on the other hand, have a distinctive look. In addition to the typical for Furla padlock these bags have pretty geometric patterns or happy fruit, animal or floral motifs. It shows the well-known Italian combination of minimalism and avant-gardism. If you want to buy a new leather bag that combines a classic look with imaginative glamor, you are at the right place at Lederwaren Weidner. Here you will find the most beautiful bags from different manufacturers in a clear presentation. The necessary information on, for example, delivery and payment can be reached just as quickly as the latest collections of well-known manufacturers. For a quick overview, the list display option is also helpful, allowing you to see the product information directly on the brand page. Take a look at the models available and enjoy the benefits of online shopping. Ordered conveniently on a PC or tablet, your new leather handbag will be shipped to your home adress within a short time. You do not have to do without the service of a store purchase: Our consultants can be reached by mail or phone. Feel free to visit our online store after browsing through one of our branches or reserve products online. We welcome you in Vienna and Baden. There, as well as in our online shop, we show a first-class selection of great leather goods. These should suit you and give you pleasure for a long time. Therefore, our consulting team is there for you before and after your purchase. As a leather goods specialist, we answer your questions about bags and accessories in a competent way and help with the selection when needed. After ordering in our leather goods online shop, you benefit from a free shipping within Germany and Austria and can soon wear your new Furla bag. From the natural product leather, the employees of the established company have made high-quality accessories: the skilful processing creates products that you can accompany with good care throughout life. Furla bags are not short-lived wear products, but gems that stand for years of carrying fun. This is also ensured by the practical details such as the pocket bottoms with their metal feet. The bags live from an aesthetic with a certain class and an Italian design that will never go completely out of fashion. It is not for nothing that Furla is considered a lifestyle brand with a high quality standard that perfectly matches the company philosophy of Lederwaren Weidner. As an Austrian family business, we only offer goods that meet our high standards. One of the advantages of our leather goods online shop is the time factor. You not only save time by eliminating the journey, but you can also take your time with the selection: just place one or more Furla bags in the wish list of your customer account and decide later. In addition, you can create a comparison list and directly compare some designer bags. With so many attractive handbags, the decision is not always easy. That's why you're welcome to call our hotline for advice on which Furla bag best suits your lifestyle. Start your journey of discovery through the world of Italian handbags and browse through our leather goods online shop!